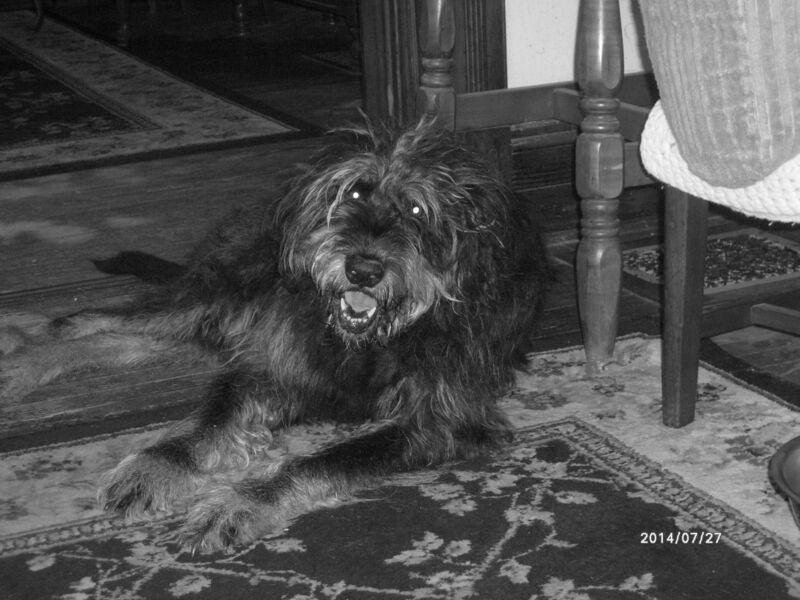 Born sometime in the early autumn of 2002 of mixed parentage, Newfoundland and Irish Wolfhound, Greta and her brother, Hans, were unceremoniously dumped in my fenced backyard during a snowstorm in January, 2003. For ten years we proved inseparable, we three. (Try walking through old house doorways flanked by two behemoths, one weighing 135 pounds standing 32 inches, the other, the male, weighing 150 pounds standing 35 inches.) They declined to eat unless I was present in the kitchen with them, a fact made painfully clear when I took a trip in 2004 for five days, and the dog sitter called and suggested I phone and leave voice messages for them to hear. Within three days of arriving, Greta could climb steps, even the steep interior stairs of the house. I remain convinced that her first climb was accomplished from curiosity and to demonstrate to me that she was not ordinary. She persisted in ‘showing’ Hans how this was done until, at 16 months, Hans finally learned to climb stairs, yet Greta never stopped ‘showing’ him the method of their large, long-legged kind for going up and down narrow stairs. In the car, Hans would jump into the front passenger’s seat, sit down, put one large forepaw on the dashboard, stare at other cars with the wind blowing across him while Greta stretched out in the back seat gazing out the side windows content to be chauffeured from one adventure to another. While Hans greeted me with flopping ears and wagging rear end, mouth open and tongue askew, Greta’s methods of demonstrating affection were more subtle: a loud slapping of hard wood floors with her powerful tail; resting a paw or her head on my foot to denote, ‘Stay, Man’; pulling a jacket from its peg and sleeping on it; a protectiveness that went to the absurd (to object to routine collection of trash, for example); a ready tolerance of other humans invited into the house. Hans’ strategy was to endear himself to Greta and me, which he did to the fullest. Greta’s strategy was nuanced, to endear herself to humans and so become irreplaceable by her standards, and by those standards she exemplified her strategy for success. She had always demanded attention, proof of affection, as her due, but that was part of our bargain. For managing her brother, for protecting me and mine, for being herself, food and shelter were never quite enough. She went the further step, enforcing fairness in food allotments, attention, bedding, etc., demanding recognition, even as a youngster, as the alpha female. Her social skills extended her strategy, herding individuals, including a cat, into a pack and holding that pack together across the years. 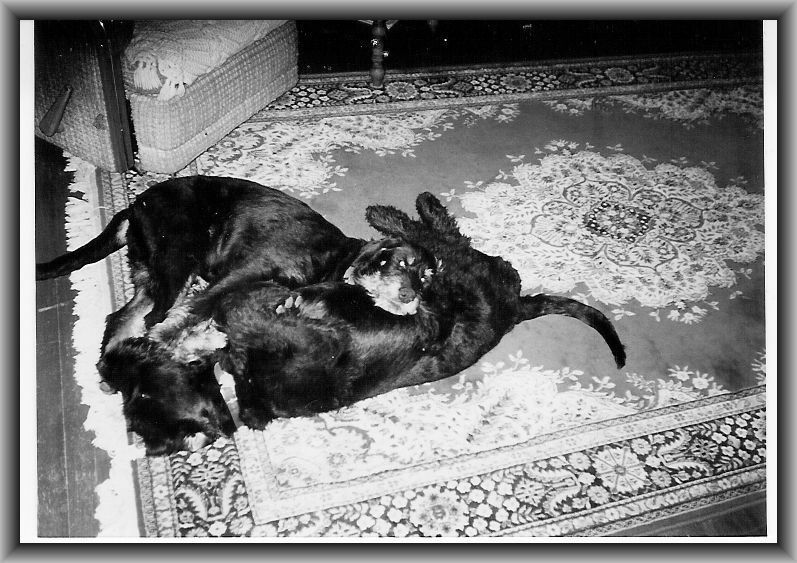 I have been attached to other dogs before, a German Shepherd (Franz), for a short time Beagle (Riley) and Airedale Terrier (Nigel), to a Long Haired Collie (Peg, 1969-1979), Brenna (Black Lab, 1979-1993), and Meg (Chocolate Lab, 1991-2006). Each was particular, intelligent, devoted. Greta would have led them all, dominated each. Her intelligence, speed and energy were remarkable. She could instantly assess complex situations and grasp her desired place within them. I once timed her with a stop watch in her adolescence. She ran 2/3 of a city block, with Hans in close pursuit, in 7 seconds for no reason other than the sheer joy of running. Squirrels panicked at the mere sight of her standing, ready. She not only understood human intonation, but some of the words themselves. Her facial expressions wrote volumes across the years. Alert, smart, steadfast, good-natured and endearing were words used by others to describe her. I simply called her my prize in the Cracker Jack Box, and she was. For eight weeks Greta declined until today she failed. Even as she declined, she threw herself at dying as she took her living, holding nothing back. She stopped eating days ago, refused water for more days. She lay trying to be alert and exhausted by the efforts as I sprawled in a chair near her petting and recounting our lives together. Dying is not the sanitized pathos of commercial television; rather it’s messy, foul, odorous, stressful and uncomfortable. (Perhaps that is why so many people and pets are whisked to places of isolation, abandonment and medical euthanasia.) I was slow to realize that Greta was using her own death as a gift. By enduring all the unpleasantness of dying, she was messaging the pack—those who remain—celebrate my life, witness my dying, prepare for my death, remember what I taught you, arrange yourselves accordingly. Just after noon, she gently maneuvered a paw onto my foot. (“Stay, Man.”) She took two quick, shallow breaths, exhaled a long, deep sigh and died. I buried her next to Hans with her last rawhide chews as grave gifts. To those for whom a dog is merely a pet, an accessory or a child substitute, a nuisance or just another responsibility, platitudes express the grief at their loss. To those for whom a dog is complete as a self, a living, loving companion, it is enough to say that absent such a companion the world is bleak and without color. Sit tibi Terra levis, Greta. Accipe in perpetuam, Greta et Hans, ave atque vale. This entry was posted in Uncategorized and tagged death, dogs, dying by James. Bookmark the permalink. A fitting tribute, and the photos you chose for all three posts are touching. Hale and farewell!